A micrograph of an inflamed fatty liver. 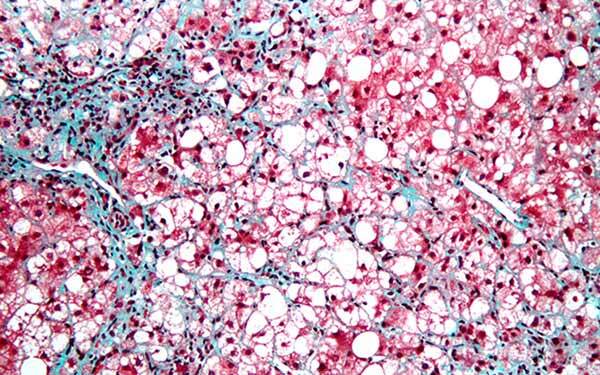 White indicates areas of fat; red are hepatocytes or liver cells. Bluish areas are fibrotic strands. Image courtesy of James Heilman, MD. The findings are published online in the journal Gastroenterology. Loomba and colleagues performed a cross-sectional analysis of 60 pairs of twins residing in Southern California. Forty-two pairs were monozygotic or identical, meaning they developed from a single fertilized egg that split to form two embryos. Eighteen were dizygotic or fraternal, developing from two different eggs, each fertilized by separate sperm cells. Using two advanced magnetic resonance imaging techniques that quantify fat content in the liver and liver stiffness (a measure of fibrosis), the researchers found that 26 of the 120 participants had nonalcoholic fatty liver disease (NAFLD), which can be a precursor to development of more serious conditions. Hepatic steatosis and liver fibrosis correlated strongly with monozygotic twins, but not with dizygotic pairs. Loomba said the research team plans to expand their research to include the role of the microbiome – the collective genomes of the microorganisms that reside within and on humans, and which also indicates a degree of heritability. Hepatic steatosis and fibrosis are among the hottest areas in research and medicine at the moment, according to Loomba, with more than a dozen clinical trials currently underway. NAFLD, which is characterized by hepatic steatosis, is the most common cause of chronic liver disease in the United States, affecting 80 to 100 million Americans, with 18 million believed to have the more serious NASH. Co-authors include Nicholas Schork, and Karen E. Nelson, J. Craig Venter Institute; Chi-Hua Chen, Ricki Bettencourt, Ana Bhatt, Brandon Ang, Phirum Nguyen, Carolyn Hernandez, Lisa Richards, Joanie Salotti, Steven Lin, Ekihiro Seki, Claude B. Sirlin, and David A. Brenner, all at UC San Diego. Funding support for this research came, in part, from the American Gastroenterological Association Foundation, a T. Franklin Williams Scholarship Award, Atlantic Philanthropies, Inc., the John A. Hartford Foundation, the Association of Specialty Professors and the American Gastroenterological Association (grant K23-DK090303).